I owe Terry1954 a great big hug for nominating Grandmother Musings for the Liebster Blog Award. When I first began blogging, I would read other blogger’s posts and wonder at all the awards posted. I wondered if I would ever receive an award. In the spring, Terry1954 sent me a note saying that she had nominated me for the Sisterhood Award. I was so excited that I called my husband at work to let him know that I had won an award. Since then, I have been honored with several awards, and I owe it all to Terry for starting the blessings. Please visit Terry at her blog. She is a loving and beautiful woman who shares the highs and lows of life with her readers. She affectionately cares for her brother, Al, with Parkinson’s disease. Terry also writes wonderful poems and stories to warm your heart. She is a very talented writer and blogger for whom you will want to follow. 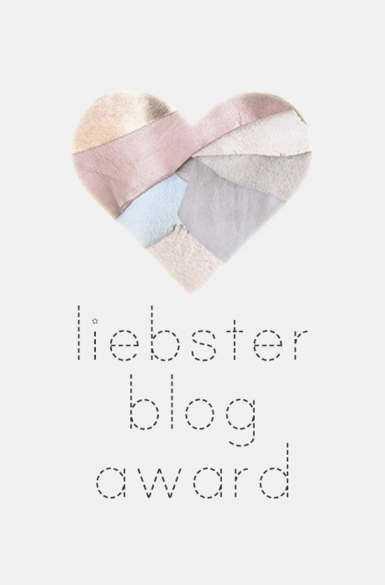 The Liebster award is given to up and coming bloggers who have less than 200 followers. What is a Liebster? The meaning: Liebster is German and means sweetest, kindest, nicest, dearest, beloved, lovely, kind, pleasant, valued, cute, endearing, and welcome. So what do we have to do to show our appreciation? If you could go anywhere, where would you go, and why? I would like to go to the Bahamas or some island paradise. I want to feel the warmth of the white sands in my toes, smell the ocean and the tropical flowers, and just relax. What was your reason for starting a blog on WordPress? My reason for starting a blog was to write. I have always been a writer, but was not practicing the craft. My blog gives me a place and a reason to write every day. What is your most frequently visited blog and why? 20 lines or less is a blog I frequent often. I love to see what new challenges are posted. Did you look at Freshly Pressed today? If so, which featured blog post did you like the most? Every day adventures in life. What type of atmosphere most inspires you to write/take photos/illustrate/whatever it is that you like to do? I like quiet when I write. Sitting at the kitchen table late at night when everyone else is sleeping, quiet. If you could be any celebrity for a day, who would you be? Tina Fey- Maybe I could then get some great comedy tips. What is something that you would like to see people post more about? I am not fond of Starbucks. ( I know…I am crazy! ) If I have to get something at Starbucks it is just a regular lite roast. If you were a word, what word would you be? 1. Name a book you would read over and over again? 2. If you could have 3 wishes granted, what would they be? 6. What personality traits do you dislike in other people? 7. What is your least favorite mode of transportation? 8. If you could witness any event past, present or future, what would it be? 9. What did you do growing up that got you into trouble? 10. When you have 30 minutes of free-time, how do you pass the time? 11. What movie do you flat-out refuse to watch, no matter how good people say it is? I cannot wait to see the answers my nominees will write!!! Please trackback to this post or leave me a comment with your link because I would love to read all the answers! Please check out these awesome blogs! Don’t forget to leave them a comment. Thank you to all of you who follow Grandmother Musings. Great People-Great Friends-Wonderful Community! Posted in Awards and tagged awards, Grandmother Musings, gratitude, honor, Liebster Blog Award, postaday, terry1954, thankfulness. Bookmark the permalink. Congrats for your.. your blog deserves it.. always entertaining and full of interesting information. Congratulations once again, Jamie! I enjoyed these new questions and your answers to them–you came up with some good qs, too! You made our morning!! First Congratulations on your award!! Second, thank you so much for our nomination, Joshua’s words this morning when we read it “Way to go grandma!” We are working on our acceptance post and hope to have it published later today. We send our heartfelt thank you and blessings your way. Thanks, Judy. Love your movie quote. That’s a great one. I will get to this soon (I have a bunch of piled up awards I’ve neglected during the busy summer. Yeah! Yahoo! Yippee! & Congratulations! again! I guess you know that I’m off to click on your nominee links here, too.